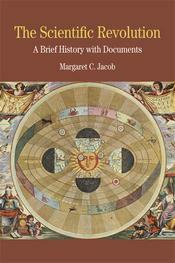 This volume by Margaret C. Jacob explores The Scientific Revolution from its origins in the early sixteenth century to its widespread acceptance in Western societies in the late eighteenth century. Jacob’s introduction outlines the trajectory of the Scientific Revolution and argues that the revival of ancient texts in the Renaissance and the upheaval of the Protestant Reformation paved the way for science. The collected documents include writings of well-known scientists and philosophers, such as Nicolaus Copernicus, Francis Bacon, Galileo Galilei, René Descartes, and Isaac Newton, as well as primary sources documenting innovations in medicine and engineering, advances in scientific investigations, and the popularization of the scientific revolution through academies and their journals. Document headnotes, questions for consideration, a chronology, and a selected bibliography support students’ study of the Scientific Revolution. "The author clearly explains concepts and adds interesting facts that other readers do not cover. The documents she has chosen are both significant and fascinating."